Performers include: Michael Imperioli, Aisha Hinds, D.J. Cotrona, Erin Cummings, James McDaniel, Jon Michael Hill, Natalie Martinez, and Shaun Majumder. 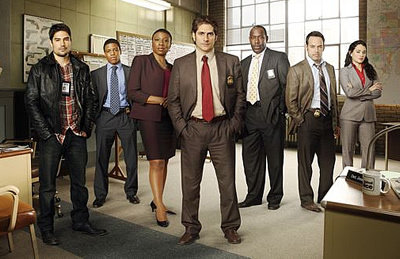 This police drama focuses on the diverse team of detectives working in Detroit Homicide. No one really knows Detective Louis Fitch (Michael Imperioli) as much as they think they do, yet he’s the first one to clock in and the last one to clock out every day. Some have heard rumors that he’s in Detroit because of an incident that drove him out of New York City, but it’s never been confirmed. He’s the master interrogator of the Homicide unit and is known for closing cases. He’s very methodical and picks the intellectual choice over the emotional one. Fitch’s partner is Detective Damon Washington (Jon Michael Hill), a rookie in Homicide. He’ll soon be a rookie at home as well as a new dad, and will have to learn to balance the two. He has a great record and brings a lot of enthusiasm. Hopefully his childhood growing up in Detroit has set him up for this new direction in his life. Detective John Stone (D.J. Cotrona) has only been a part of Detroit Homicide a year, so Washington’s joining means he doesn’t have to be the new guy anymore. He used to work undercover, so knows how to take care of himself in dangerous situations. Stone wasn’t always one of the good guys though as he was once on the wrong path. He uses that when he interrogates the perps. Detective Ariana Sanchez (Natalie Martinez) has been around just a little longer than Stone, having transferred from Vice. She’s beautiful but, having older brothers, she’s not afraid to get down with the guys. Her strength is in empathizing with the victims and families. Detective Vikram Mahajan (Shaun Majunder) disappointed his parents who are originally from Bombay. He has an engineering degree and his dad wanted him to follow in his footsteps and work at Ford. Mahajan takes a lot of pride in his style of dress and has a very dark sense of humor. Mahajan’s partnered up with Sargent Jesse Longford (James McDaniel), who is just a year away from retiring. He’s getting ready to move to Italy, something he used to dream of doing with his deceased wife. His joke is that he’s been a cop in the city so long that when he started, half the suspects were white. Lieutenant Maureen Mason (Aisha Hinds) oversees it all and has done the work to get to this point in her career at the Detroit Police Department. She’s solved some of the city’s toughest murder cases. Mason constantly feels the heat from those above her, but her strength gets her through it. Somehow, she finds a way to balance her work with being a single mother of two. Longford turns in his retirement packet. He just needs to do one thing before it’s a done deal, and that’s rip up any and all paperwork that says he can’t be a cop. This last minute change of heart may not be enough to save his job. The department is moving in a younger direction. Longford often says, “I’ve been a cop in Detroit so long….when I started, half the suspects was white.” Unfortunately, that’s not a selling point now. Fitch and Bobby meet up with Washington and his young son at a museum. They aren’t the only ones enjoying the exhibits. Big Al Stram is there to rope Fitch into being his inside man at the police department. His not-so-subtle threat on Bobby’s life has Fitch a little on edge. The rest of the squad is also in turmoil as they investigate the brutal murders of an entire family. Big Al Stram has been bringing drugs across the border from Canada. When Fitch learns that a member of the murdered family was a customs agent, he realizes his former NYC nemesis is behind the killings. Stram gives Fitch the gun that was used to kill the kids to frame someone else for the murders. This time Stram threatens the family of the man who recently asked him to be a godfather—his partner, Detective Damon Washington. Fitch does his best to coerce a confession out of a suspect. The threat of being taken away from his family almost gets the guy to cop to a crime he didn’t commit. Almost. The interrogation is interrupted when Jess Harkins tells the squad that she knows Al Stram is behind the murders. He met with an associate that the feds couldn’t identify. That mystery man was Detective Louis Fitch. Washington is baffled when Fitch asks him to be Bobby’s godfather. After all, his kid is the one getting baptized. What Fitch is really requesting is for him to look out for his son. As much as Washington wants to be in the trenches with his partner, Fitch convinces his him that what he’s asking now is far more important. Fitch tips off Stram about the feds. He then makes his way to the mobster’s second hideout where Longford and Mahajan plant the murder weapon on one of his henchmen. As for Fitch, he shuffles Stram out the door and drives him to a cabin across the border. He advises the mob man to lay low until things die down in Detroit. Stram makes the long snowy walk to the cabin until his phone rings. It’s Fitch. He says, “Go back to New York. Stay out of my city.” Stram turns around to see Fitch standing before him with a gun by his side. The mob man can’t accept Fitch’s offer. Stram and Fitch simultaneously draw guns and shoot. Special Agent Jess Harkins shows up at Washington’s baby’s baptism with news. Two of Al Stram’s men were found handcuffed in the back of a parked police car. The murder weapon used to kill that family was on the front seat. The mafia guys claim they were abducted by three men. One of their kidnappers was Louis Fitch. Lieutenant Mason says Fitch wasn’t involved in the abduction because he was at the church for the baptism. Washington adds that they couldn’t have done it without him. After all, he’s the baby’s godfather. The mob men will testify otherwise. Lieutenant Mason assures Harkins that people are more likely to take the word of an entire squad of Detroit’s finest. Mahajan’s overseas fiancee found out he’s been unfaithful thanks to the wonderful world of social networking. The arranged marriage is off, as is Longford’s retirement. Tuscany will just have to wait. As for Fitch, he finally gets up the nerve to ask out Sanchez. He even manages to do it face-to-face, as opposed to over the phone. They’ll go ice skating with Bobby. But first Fitch and his boy will grab a Coney and a soda. Bobby tells his dad that they don’t call it a soda here. They say “pop” in Detroit. Everybody knows that. First aired: March 20, 2011. I was disappointed that the network cancelled this show. It was one of the better ones………I will truly miss watching it. I AGREE TOO. THIS WAS A GREAT SERIES! Michael Imperioli was GREAT, I cried every show. Natalie Martinez appeared the other day on CSI: New York, also Jon Michael Hill appeared on ELEMENTARY. Good luck to them. One of the biggest disappointments I’ve had with TV in years was the cancelling of Detroit 187. It should be renewed even at this late date, or taken up by another network. I agree, why waste veiwers time with the idiot shows they put on today. Detroit 187 was one of the best shows I have watched. Love the characters and the storylines. Incredible series shut down for what? This was entertainment; who runs these TV stations anyway?